P hysical inactivity, especially sitting for long periods, has been linked to increased mortality rates second only to smoking, according to research from the American College of Sports Medicine. For those that reported sitting for more than 23 hours per week combined, there was a 64 percent greater chance of dying from cardiovascular disease than those who said less than 11. The American College of Chest Physicians even found a link between sitting at home during leisure time and suffering poorer sleep and decreased attentiveness during work the next day. Although it is impossible to negate the effects of long hours of sitting entirely, there are many things that the average worker can do to help, according to Lifehack. First, plan to break up the day into 30-to-60 minute chunks, separated by a short walk, stretch, or other activity. Finding ways to walk at work could be as simple as having a walking meeting or bringing in a standing desk or even a cutting edge treadmill desk. There are simple stretching routines that can be performed unobtrusively in an office that can reduce neck and back pain by 72 percent, according to studies at the Wheeling Jesuit University. Good practices like parking far away from the office, taking the stairs instead of the elevator, or even walking or biking for your commute can add movement to the day. Take care to schedule lunchtime so that you won’t be forced to grab unhealthy food or eat sitting at your desk instead of taking a real break. Drinking plenty of water will not only provide other health benefits, but it will also give you a reason to stand up and move around more often as you go to the restroom and refill your bottle. 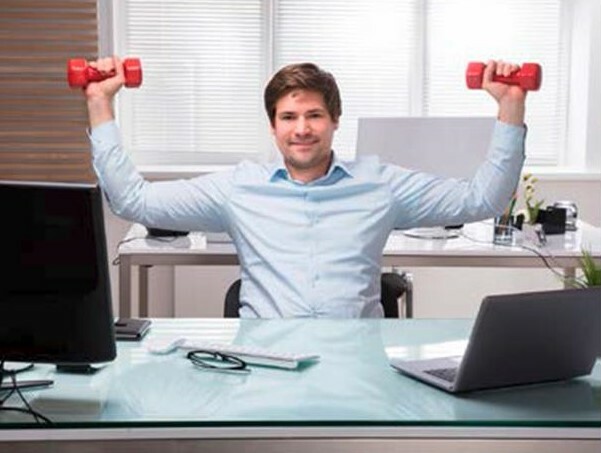 After work, several health minded coworkers could even get together for athletics or group workouts as an alternative to sitting at home.